Couture Carrie has done a fantastic post on the upcoming nautical trend for Summer 09. For me, it is a great trend, ever since I was a girl, its been in and out of style and it is a great summer look. The Telegraph have put together a lovely ensemble from Prada, APC and Chanel. 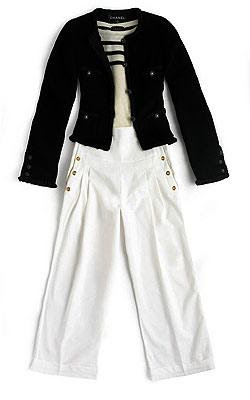 This is a great outfit, navy jackets and white trousers are a stylish, popular choice to embrace this trend. I thrifted a lovely George Rech vintage breton style jumper, which I will pair with my white Ralph Lauren jeans this spring and summer-how will you rock this trend? This is my FAV look. I love it. I really need to get a navy nautical style blazer. Thanks for this great post. I've never gone for the nautical trend...I'm not that crazy about navy blue! The blazer is fab! I love nautical style too! My favourite look too, white and navy blue is so perfect in the sunshine! I am not carzy about this trend, but I love the colors seperately. This outfit is cute, though! Thanks for letting me see something warm ... we're having our coldest day of winter here. Its just one of those things that you don't want to celebrate. Oh yes, I love nautical trend. White, navy blue, red and stripes are my fav details in it. Hi Sharon Rose - I adore nautical trend. Fashionable! Hi there-thanks for all your comments. Its great there is a choice of key trends out there this summer, if nautical doesn't suit!! Hi ladies-great comments, much appreciated! I've had sailor pants for years and I'm sure they'll make an appearance come spring ... but full-on nautical doesn't work for me. Looking forward to seeing YOUR interpretation, tho! Thanks for the shout out, Sharon darling! Love this blazer! Hi Sal-the trend is very versatile, so we can pick key pieces and adapt to it! Hi Couture Carrie-so welcome my dear! Oh I love nautical. Those white trousers look tres stylish! I've always like nautical. i will probably spice it up by throwing some red into the mix. that outfit is fabulous; i'm quite in love with the jacket! I love nautical. I think I'll be wearing my sailor dress and alot of stripes. I've been searching for a pair of white sailor pants for years. Maybe this year I'll finally find one! Hi anchibride-hope you track a pair down my dear! !